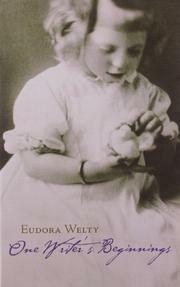 Delivered as three talks (April 1983) in Harvard's William E. Massey Sr. Lecture series: a Welty childhood memoir, emphasizing the memories and habits that later helped young Eudora become a writer. The first section centers on listening, on reading and secrets and curiosity--as Welty recalls the voracious reading, the expressive reading-aloud of her mother: "She read Dickens in the spirit in which she would have eloped with him. . . . When she was reading 'Puss in Boots'. . . it was impossible not to know that she distrusted all cats." (So, when Welty writes her stories, she hears every line in an inward voice, a voice that "I have always trusted. . . .") She also remembers the secret pleasures of curiosity and suspense, the cornerstones of the Bible and Jackson's Carnegie Library--where Mrs. Welty said to the forbidding librarian: "Eudora is nine years old and has my permission to read any book she wants from the shelves, children or adult. . . . With the exception of Elsie Dinsmore." Then, in a section called "Learning to See," Welty tells of summer trips to grandparents in West Virginia and Ohio--feeling independence take possession of her on an ancestral mountain-top, feeling the trips themselves as stories ("not only in form, but in their taking on direction, movement, development, change"). And the third section, "Finding a Voice," takes Welty into the outside world: discovering S. J. Perelman at college; writing and taking photos as a WPA publicity agent ("I learned in the doing how ready I had to be. . . . Life doesn't hold still"); encountering mortality; and finding her kind of fiction, her voice, especially in the making of Miss Eckart ("out of my most inward and most deeply feeling self") in "June Recital." Less shapely or focused than Welty's stories, and a little too wispy in its self-portrait--but a welcome, often-eloquent arrival nonetheless, for Welty readers and writing-students in about equal measure.